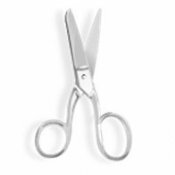 Scissor sharpening today! New classes! Thank you to everyone who participated in the River Run shop hop earlier this month. And a big thank you to Terry McFeely for coming on Friday during the hop and demonstrating her wonderful product, Terial Magic. If you missed her demo, don't worry. Terry will be giving demos in our booth at the River City Quilt Show, Nov 14-16. BOM-Anniversary Waltz, Thu, Oct 2, 10:30 - 11:30 a.m.
Imperial Blooms, Sat, Oct 11, 1:30 - 4:30 p.m.
BOM-House Warming Party, Thu, Oct 16, 6:00 - 7:00 p.m.
Blankets for Preemies, Fri, Oct 17, 11:00 a.m. - 3:00 p.m.
Handwork Sit & Sew, Mon, Oct 20, 10:00 a.m. - 4:30 p.m.
American Girl Doll Sit & Sew, Wed, Oct 22, 1:00 - 4:00 p.m.
Beginning Needle-turn Applique, Judy Cummings, 1st Mon of the month, 9:00 a.m. - noon -OR- 1:00 - 4:00 p.m., -OR- 1st Tue of the month, 9:00 a.m. - noon, starting in October, $15/class, supply list. (You must pay in advance for the first three classes, a total of $45.) 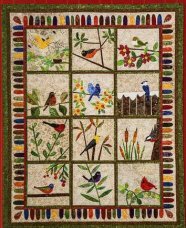 Learn to needle-turn applique and make this charming wall hanging, Backyard Birds, by Becky Goldsmith and Linda Jenkins. Judy will teach you curves, points, circles, and more. Another fun handwork class! MON A.M. AND TUE A.M. CLASSES ARE FULL. 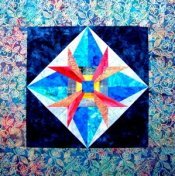 Machine Quilting with Your Walking Foot, Beth Kondoleon, Fri, Oct 10, -OR- Fri, Nov 7, 10:00 a.m. - 4:00 p.m., $40, supply list. Come join Beth as she shows you how to quilt with your walking foot. You will learn some basics of the walking foot, then move on to do some matchstick and crosshatch quilting. We will explore using some of your decorative stitches along with quilting some curves, circles, and radiating designs. Beth will demonstrate which templates you can use to make life easier. So come join the fun and start quilting those tops! Beginning Free Motion Quilting, Dana Lahargoue, Wed Oct, 15, and Tue, Oct 21, 5:30 - 8:30 p.m., $40, supply list. In the first session, you'll learn machine set up and basic shapes and backgrounds and will have lots of time in class to practice. In the second session, you'll take your new found skills and put them to work on a continuous line design which you can use as a small wall hanging or pillow. This class is the perfect opportunity to learn from a wonderful instructor. Dana is an award winning machine quilter with many years of machine quilting and teaching experience. Foundation Paper Piecing, Dana Lahargoue, Thu, Oct 30 and Nov 13, 5:30 - 8:30 p.m., $40, supply list. Come and learn this traditional quilting technique that produces perfect blocks, even with small pieces! The class project will be "Rays of Hope" by Carol Doak, which can be made into a pillow or wall hanging. We've received the new Bali Pops and Bali Snaps from Hoffman of California! We have Bali Pops in Cockatiel, Hummingbird, Sparrow, and Lorikeet, and we have Bali Snaps (5" squares) in those four colorways, plus Parrot and Sandpiper. And as always, they're gorgeous. We also have a new collection from Free Spirit -- the Iznik Collection from Snow Leopard Designs is inspired by the decorative pottery and tiles that were produced in the town of Iznik in Anatolia Turkey between the 15th and 17th century. From Andover, we have this beautiful contemporary collection called Field Day. 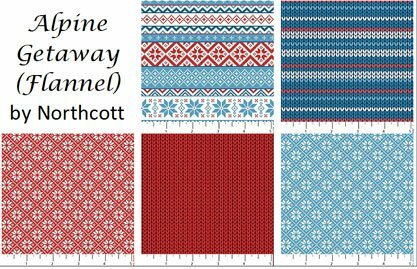 And from Northcott, a fun flannel collection, Alpine Getaway. Of course, we're always restocking and adding our solids, blenders, and batiks.